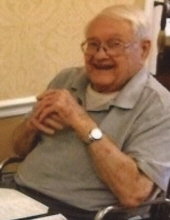 Celebrating the life of George Edward Withers, Jr.
Obituary for George Edward Withers, Jr.
George Edward Withers, Jr., 89, widower of Mary Jane (Ashby) Withers, formerly of North Augusta Street, passed away Thursday, November 1, 2018 in Brightview at Baldwin Park. Mr. Withers was born on December 12, 1928 in Buena Vista, Virginia the son of the late George Edward, Sr., and Louise Feild (Boggs) Withers. George was a member of Marquis Memorial United Methodist Church, and retired from the City of Richmond as an Accountant. Mr. Withers attended Virginia Episcopal School in Lynchburg, was a graduate of Hampden-Sydney College and while his health allowed, he enjoyed gardening. In addition to his wife and parents, Mr. Withers was preceded in death by his sister, Jean (Withers) Alfred. Mr. Withers is the last surviving member of his immediate family. Surviving is a son, George “Ed” Withers, III and his wife Sophie (Vytrac) Withers of Audubon, Pennsylvania; four grandchildren, Nathan Withers, Chloe Withers, Grace Withers, and Olivia Withers and a special cousin, Elizabeth (Boggs) Ingles. A celebration of life will be conducted 11:00 a.m. Monday, November 5, 2018 in the Coffman Funeral Home Chapel by Pastor John Ward. Burial will follow in Thornrose Cemetery. It is suggested those desiring make memorial contribution to a charity of one’s choice. To send flowers or a remembrance gift to the family of George Edward Withers, Jr., please visit our Tribute Store. "Email Address" would like to share the life celebration of George Edward Withers, Jr.. Click on the "link" to go to share a favorite memory or leave a condolence message for the family.